A unique group of musicians will make their debut at a Heartland Community College auditorium this spring. The Heartland Community Trombone Choir is comprised of musicians with ages ranging from 16 to 67. Joe Tiemann, director of the choir and adjunct music instructor at Heartland, said he formed the group for multiple purposes. High School students who are interested in joining the group to gain Heartland credit would contact Mr. Tiemann to form an independent study project. The number of credits earned would be determined by the structure and depth of the study. Participation in the choir for high school students, or anyone else, doesn’t have to be tied to credit. Unlike some music ensembles at Heartland, the Trombone Choir is open to anyone, of any age, who is looking to join. 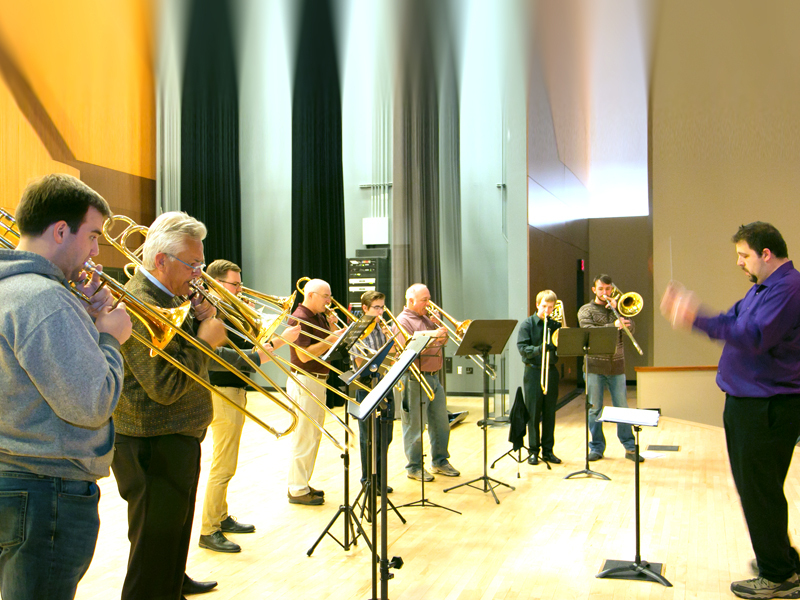 Tiemann pairs some of the less experienced members with more experienced trombonists. The choir, currently made of up 10 players, has been rehearsing since the end of January. They are set to give their debut public performance on the Heartland Community College campus in Normal. The choir will give a free performance at Astroth Community Education Center (ACEC) auditorium at 7:00 p.m. on Tuesday, May 1.